We had to put Lexi to sleep yesterday and my heart hurts. I miss her. I'm sorry about your loss :(. I know how crappy it feels. Hugs hun! Oh no. 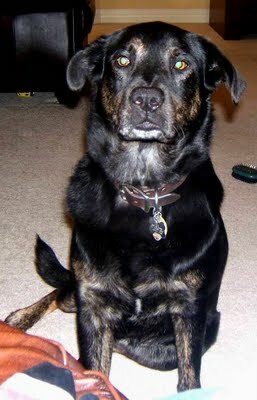 :( I know just how you're feeling - we had our dog Andy put to sleep less than a year ago and it was devastating. If you're anything like me, you'll think you see your dog in her usual spots, and hear her walking around, for like a month. The pain gets better, but I still miss my Andy. I know how hard that decision is. We put ours down 4 years ago and I still miss him. It gets easier to handle, but you never forget! Hoping 2011 stops sucking for you! Amanda, you know how much I love animals, dogs especially, so my heart is breaking for you. I actually cried reading just that one little line and looking at that photo of your gorgeous Lexi. It is so hard to lose a member of your family... know that my love and hugs are with you, SB and the boys. I'm so sorry. It's so hard to lose our fuzzy family members. If love could save them, they would live forever.